Leeds United dropped their first points of the season, but showed their battling qualities as they came from behind twice to earn a 2-2 draw at Swansea City. For much of the match it looked like Leeds-born striker Oliver McBurnie was set to haunt the hometown club he supported as a boy as he struck twice for the Welsh side. But Kemar Roofe levelled before half-time and United’s ex-Swansea player Pablo Hernandez struck 11 minutes from time to give Leeds a hard earned point that took to them to the top of the table. Head coach Marcelo Bielsa had been forced into making his first team change for a Sky Bet Championship game with skipper Liam Cooper pulling out in the warm-up with a hamstring injury. With Pontus Jansson not making the trip because of injury it left the Whites without a senior central defender with teenager Jamie Shackleton drafted in to play right-back. Unlike their previous games Leeds did not start sharply. They could not string two passes together, found themselves hurried at the back and came under pressure. But despite a makeshift back four that included two full-backs by trade, Luke Ayling and Gaetano Berardi, at centre-back, they defended well enough to start with. They were relieved to see Connor Roberts miskick when well placed in the box while Martin Olsson bent a shot over and Joe Rodon sent an effort over from a corner. Roberts’ angled shot flicked off Barry Douglas and went wide with United’s only response being a 30-yard free-kick by Douglas that was easily saved by home keeper Erwin Mulder. A home goal finally arrived on 24 minutes when Kalvin Phillips lost the ball in attack for Leeds and Swansea broke quickly with Barrie McKay and Bersant Celina setting up McBurnie to shoot home. Shackleton offered a rare threat for the Whites when getting in behind the home defence on the right, but his cross went straight to Mulder. At the other end the clever Celina sent a shot just wide after Shackleton’s crossfield pass had been intercepted. The first real chance for Leeds came on 35 minutes when Berardi found himself unmarked in the box, but his header from Douglas’s cross went over. Celina was again in the thick of the action for Swansea only for his clever chip from the edge of the box to go narrowly over. Leeds’ improvement after their poor start was highlighted in the 40th minute when Shackleton took on and beat Swedish international Olsson and his low cross was converted from close range by Kemar Roofe to make it 1-1. Swansea made the better start to the second half, however, as they went back ahead with McBurnie left free to send a superb header past Peacock-Farrell. It was time to dig in again for the visitors and McKay’s first time shot from the edge of the box was not far wide. Shackleton continued to be a threat going forward for United, but his cross-shot sent the ball into the side netting after he had taken on Olsson again. Pablo Hernandez almost got on the end of a Shackleton cross before McBurnie came close to his hat-trick for the hosts, his low shot being well saved low down by Peacock-Farrell. Leeds kept plugging away and after Saiz sent an ambitious lob well wide they came up with a second equaliser. Substitute Patrick Bamford got clear down the left and his low cross into the box was put away by Hernandez, who nipped in ahead of a ball watching defender. Both sides went for a winner in the closing stages and the hosts looked on for it when Celina beat two men to get free, but could not beat Peacock-Farrell with just the keeper to beat. At the other end substitute Jack Harrison raced onto a through ball into the box, but hesitated and could not get a shot away. 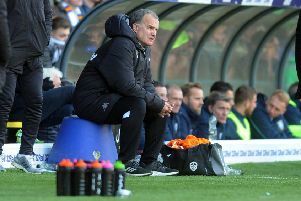 Late pressure with two free-kicks and a corner came to nothing for Leeds and for the first time in England Marcelo Bielsa was not on the winning side. He could be happy with this handy point, however. Swansea: Mulder, Naughton, Van Der Hoorn, Rodon, Olsson (Asoro 84), Fulton, Fer (Carroll 73), Roberts, Celina, McKay (Montero 64), McBurnie. Leeds: Peacock-Farrell, Ayling, Berardi, Ayling, Douglas, Phillips (Baker 24), Hernandez, Klich, Saiz, Alioski (Harrison 45), Roofe (Bamford 64).